As apples drop and leaves turn, long distance runners across the globe set new goals for the coming year. For most, these goals begin with a healthy dose of aerobic mileage and general conditioning work—a.k.a. base training. This phase of training develops strength of connective tissue, enhances the body's ability to transport oxygen efficiently and reduces the chance for injury later on. However, too often runners who are base training fail to do any type of work to remind the body how to change gears and engage different muscle fiber. The age-old remedy? Fartlek training. Fartlek, literally translated from Swedish as speed play should be utilized year round but especially during base phase training. During your longest run of the week, run a one-minute surge every six or seven minutes. This surge shouldn't be terribly hard—perhaps only 15 to 20 seconds per mile faster than your normal long run pace. At the end of the one-minute surge, simply return to your relaxed rhythm. If you have a hard time returning to a "normal" long run rhythm, you are running the surges too quickly. This work will teach you how to change gears, as well as how to deal with bad patches during race efforts. Another fartlek workout that is particularly effective during base building is one where random pick-ups are tossed in throughout the run. The late ZAP founder Andy Palmer used to say run 15 or 16 minutes worth of pick-ups during a long run—he shared no details on the length of these pick-ups or time of the recovery other than "mix it up with some longer and shorter pieces." This is a truly by-feel fartlek and is a great one to execute as you are just getting started. Descending Tempo Fartlek, a.k.a. the “Savage Fartlek"
Begin this session with a six-minute piece at roughly your anaerobic threshold—close to half marathon pace. The recovery is then half the time of the piece (in this case 3:00). Then run a five-minute piece slightly quicker than the six-minute, with the rest now being two and a half minutes. Then run a four-minute piece a touch quicker, with two minutes rest. Follow with a three-minute pick-up with one and a half minutes recovery and a two-minute pick-up with one-minute recovery. The final two pieces of the fartlek should be working into current-5K-fitness range. For more advanced higher-mileage athletes, begin with a seven-minute piece and go all the way down to one minute. Known as pick-ups that begin a bit slower and finish faster. Make sure to start with a warm-up run. Then run a two-and-a-half-minute pick-up beginning with the first 30 seconds only five to 10 seconds faster than your normal training pace. Each subsequent 30-second block should be a touch quicker than the previous, with the final 30 seconds (from two minutes to two and a half minutes) being at or slightly faster than 10K pace. After you run the two-and-a-half-minute piece, take 90 seconds jogging easily. Run another the same way. It’s recommended to run two sets: a set of four, which will be 16 minutes including recovery, and a set of three, which will be 12 minutes including rest. 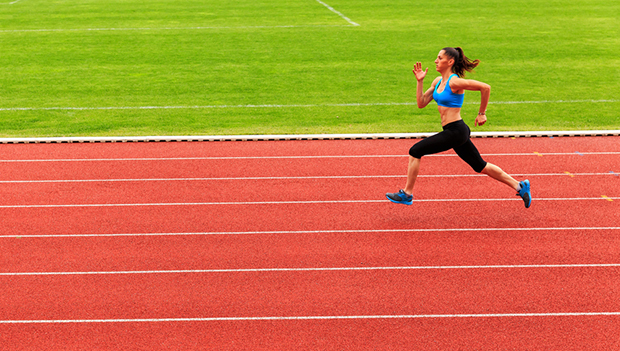 As with any well-designed training program, fartlek training can be implemented in many different ways—from the controlled strength type of long run surging to the most specific anaerobic development sessions. The latter, while rarely needed, are still an important part of your training and can develop with sessions such as six by 45-second fartlek pick-ups with full recovery (two to three minutes between each) or 15 to 20 by 20 to 30 seconds similarly. Fartlek is an excellent way to transition your fitness from each cycle to the next, from base training to race specificity.